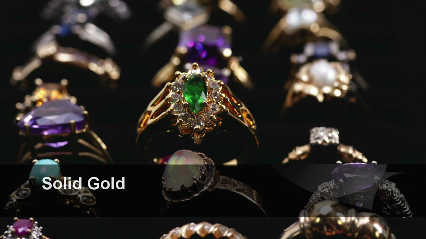 Welcome to Solid Gold, a family owned and operated jewelry store for over 30 years. We carry everything that your heart desires for yourself or someone special. Come to our store and let us help you create a one of kind engagement ring that can be found nowhere else. Already have a diamond? Choose from our vast selection of mountings to make your diamond the center piece of a new ring. We also carry loose diamonds and gemstones that can be carefully mounted by our in-house jewelry repair person in your ring, pendant, bracelet, or earrings. We can take care of all your gift and repair needs. Are your eyeglasses broken? There is a chance that we can fix them. Have a memorable gift that you want engraved? We can do that to. Can't decide what the perfect gift will be, may we suggest a gift certificate? We also have NO INTEREST layaway. Just put 10% down, and pay what you can each month. Once you have made your purchase with us, we will do a free appraisal for you and your insurance company. You don't have to worry about missing a sale because our prices are always competitive. Shop by designer on our products page, contact us at 864-878-2482 or at solidgoldinc.net. We are located in Dalton Flats between Easley and Pickens, South Carolina. **Remember to stop by for your free cleaning and inspection of your jewelry while you wait. The prices can't be beat! !